According to historical documents, those aboard the H.M.S. 'Sunshine' enjoyed regular entertainment options, such as pillorying blasphemers and nightly funerals. LONDON—Working from recently discovered ships’ logs and archaeological findings, a team of historians announced Monday they had pieced together a detailed account of the Carnival East India Company’s maiden cruise—the very first seafaring journey to the Far East dedicated solely to the enjoyment and entertainment of its passengers. According to records, the 175-foot, 1,400-ton sailing ship—christened the H.M.S. 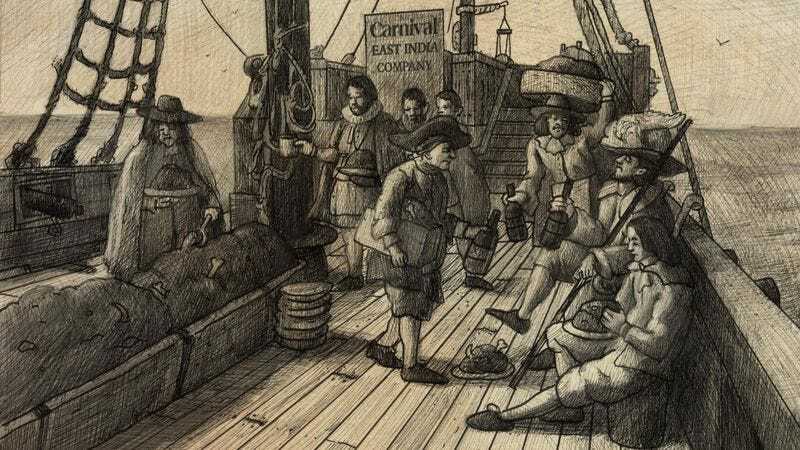 Sunshine—embarked from London in February 1605 on the first-ever “Expedition under-tak’n on behalfe of Plea-sure,” as it is referred to in writings from the time, with an itinerary that included stops in Ceylon, Malay, Nieuw-Guinea, and various tropical locales in the South China Sea. Carter noted that newly unearthed sketches of the ship indicate that the H.M.S. Sunshine was outfitted with a variety of unique features, including long communal troughs of hardtack, gruel, and grog, which were available belowdecks at any time of day or night, and a large recreational wooden slide moistened with water pumped from the bilge. Beyond its promise of general leisure, the ship is known to have offered several scheduled entertainment options, the most popular of which was the nightly opportunity to have clergymen flagellate any passengers who believed they deserved punishment for their idleness, frivolity, or other mortal sins. In addition, it is believed that voyagers could disembark at various ports of call to gawk at “savages” and buy small satchels of spices, indigo dyes, jade, or opium. Much of what is known about the ship’s onboard amenities reportedly comes from a journal kept by Myhil Osborne, a member of England’s landed gentry who, at 41 years of age, was one of the ship’s few elderly passengers. In his writings, he raved about “lodgings of gen’rous measure” in which only 20 to 30 people were bunked in an 8-by-10-foot cabin, as opposed to the roughly 80 passengers housed in identically sized quarters in steerage. Subsequent Carnival East India cruises did not fare as well, according to researchers. Pirate attacks were reportedly common, as were wrecks in which all hands were lost, often when a ship attempted to anchor off dangerous reef-ringed coastlines in search of tax-free gold. The wreck of the H.M.S. Sunshine now lies somewhere just east of the Seychelles, where historical accounts confirm it sank in 1613 after the ship’s crew mutinied and purposely capsized the vessel to avoid hearing another set by the ship’s dueling harpsichord players.